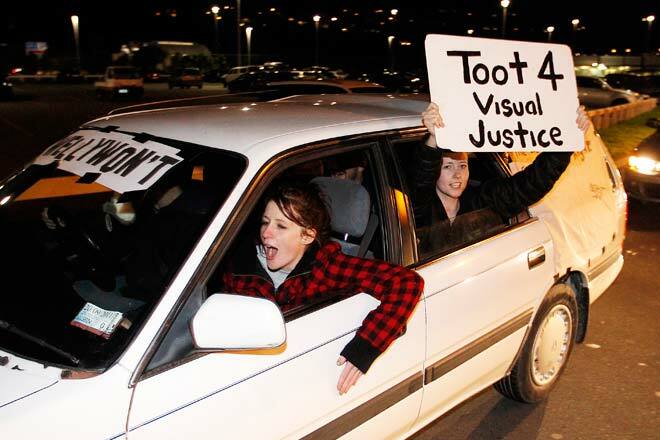 A June 2011 plan by Wellington airport to mount a large ‘Wellywood’ sign (referring to the city's film industry) on its land beside the airport generated a storm of protest amongst Wellingtonians. Many thought it was a cheap copy of the Hollywood sign, and wanted something that expressed Wellington’s identity. Some were so outraged they organised a slow-moving blockade of the airport’s terminal, clogging the traffic for several hours. This is one of the 100 or so cars on the protest.